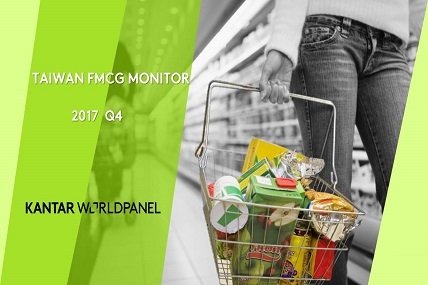 �FMCG market of Taiwan maintained moderate momentum of 3.8% growth rate. Food categories show no sign of slowing down. Products are made of simple、pure ingredients, such as fast-cooked noodles, cooking oil, soy sauce maintained growth. Categories like potato chips、solid yogurt、milk tea create trial and generate buzz by launching innovative products . As consumer life style and purchase behaviours changed, consumers are willing to buy and spend more frozen food online. What’s more, products with health benefit, such as coconut oil and sesame spread, attract consumer’s attention as well in 2017. For the non-food categories, lip gloss collaboration with famous stars and launch of Always flex foam pads triggered heated discussion. Convenient products like detergent capsules and wet tissues(replacement of dishcloth) also have good growth momentum. Channels: E-commerce maintained strong growing momentum. Online and physical channels all joined the competition during online shopping festivals (1111 and 1212) in order to create additional purchase occasions for shoppers. Costco also appealed more buyers during black Friday festive campaign.